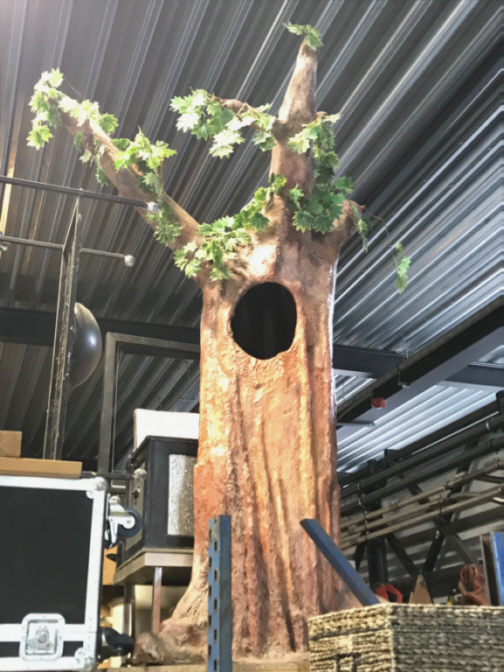 Description: Beautiful custom made tree for Professional Puppetry / Magic show. Built by a professional theatre scenery company. Branches come apart for easy transport. The audience sees an empty platform. A curtain (large cloth) is held up preventing the audiece view for a few seconds and then dropped. 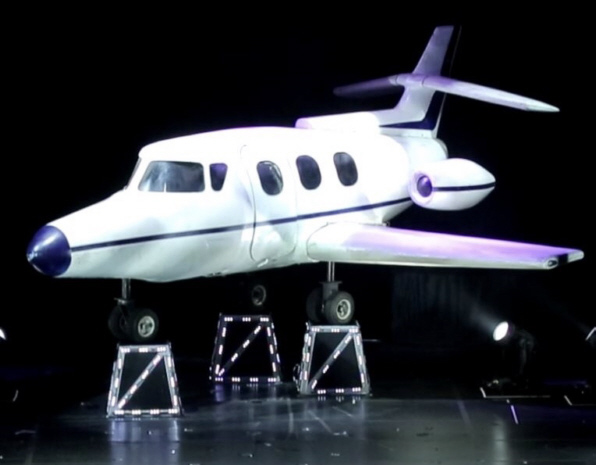 The airplane has appeared on the platform. Asrah Levitation - levitation in mid air with wire system form and table & Viktor Voitko portable gimmick - Including ATA cases and mylar backdrop. Special FX - Headless Man in very good condition - turtle neck where performer could make his head grow out and sink back in costume with a pull system. and then mask is removed and the magician appears from masked man costume. Oz Illusions. Had belonged to Tony laffan then I purchased it and used in every show for 8 years. Sadly I just dont have the space for it anymore. Includes 1 compact road case and the 2 matching red PVC trench coats I had made specifically for my routine. 7 feet tall. Could be performed on a stage with 9-10 feet height. 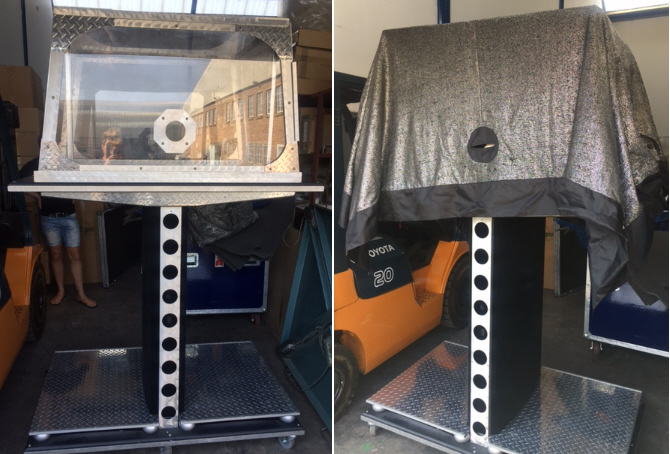 *The portable lift system is a self contained lift for the Jaws you can use where there are no hanging points in a venue. 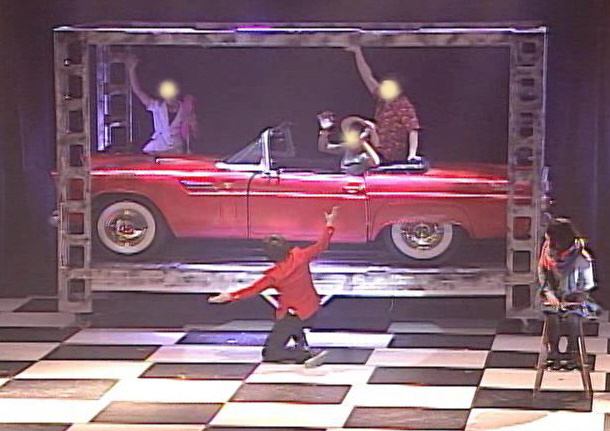 The top height is 12 feet, giving a performer 4-5 feet head room off the ground while escaping. Includes 12v electric winch and safety cables. A magician brings a lucky child up on stage and explains how their parents used to take him/her to a trip to the moon every weekend when they were little. A covered machine is presented. When it is revealed, it is a coin-operated kid's ride you see in front of a grocery store. It is retro rocket-shaped with "MOON PATROL" written on the side. Magician can dress the child up with a spacesuit and helmet. Magician gives the child a full list of instruction on how to operate it as if it were a "real" flying rocket. The magician puts the child into the ride and inserts a coin into the machine. Audience hears some exhausted/ancient rocket sounds as it starts to rock very slowly. Our first bit of comedy as we all know the feelings as a child getting in these rides and they were quite disappointing. Magician adds an extra coin and it becomes a little bit faster. This is just a tease but still funny. Finally.... the magician puts a "magic" coin into the machine. All of a sudden the ride .vibrates and breaks away from the base. Ride becomes a real flying rocket! Rocket starts to change its position to point upward with smoke and sparks shooting out as it launches to the moon. Rocket continues flies up and downward. Finally... magician covers it with a cloth and the next thing you know, the rocket flies further up and away and the child disappears as the rocket hits hyper speed. For the end, the child can reappear in the back of the house or off stage with a new alien friend. And this version can take kid and woman both. It was a special order item. 112 cm x 112 cm x 150 cm high. Used but is in good working order with normal wear. It is in very good condition and the illusion has a brand new modern look on the outside. The illusion is located in Europe, the Netherlands. Effect: You place in the cage 4 to 6 doves. Than you cover the cage and tosses it up in the air. Cage and doves vanish. 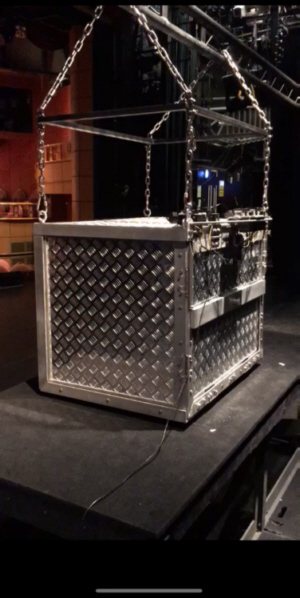 This cage has special construction for use very near to the audience and on the floor without stage. The cage has a bottom so it looks like a complete cage. It works with a air piston mechanism. You can change the vanishing speed depending on the weight of the doves. 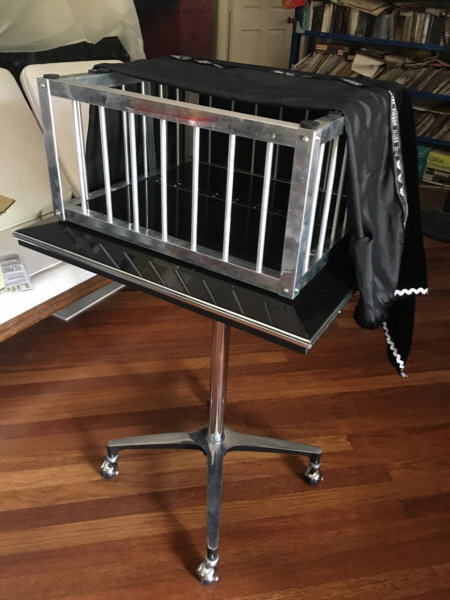 Cage is not new but in good condition and packs flat. No ATA case but comes in a solid box. Shipping from Austria / Germany. The Easel "NEVER" leaves the stage - use it throughout your show The Magician NEVER leaves the stage - you don't have to hide anything NO on-stage assistants - one off-stage helper is all you need Prediction is attached to the whiteboard - handle it just like a real whiteboard Fastest loading system ever - totally natural and logical moves at every stage. Packs small enough to travel as flight-out luggage. 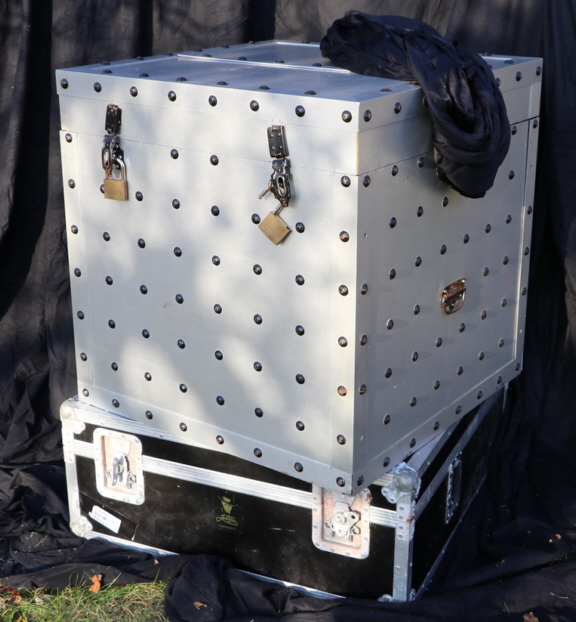 Comes with flightcase (3ft x 3ft x 8inch), spare film, pens, all ready to perform. 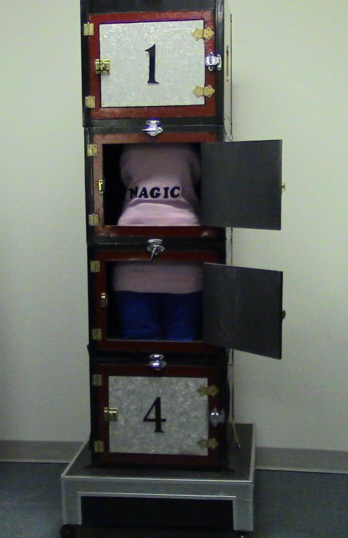 This is the original, extra large version of the Wrapped Illusion enabling you to be wrapped from head to toe yet escape or change places with your assistant instantly; only 4 of this version were ever built before they switched to only making the smaller portable version so its very rare and desirable. Pole is 6ft 6 inches tall (197cm), base and curtain hoop are 3ft (90cm) across this is a big statement piece made from aluminium but painted to look like wood. Comes complete with curtain, frame, cases and all rights paid. Its got the wear and tear youd expect on a 6 year old prop but theres loads of life left in it yet. 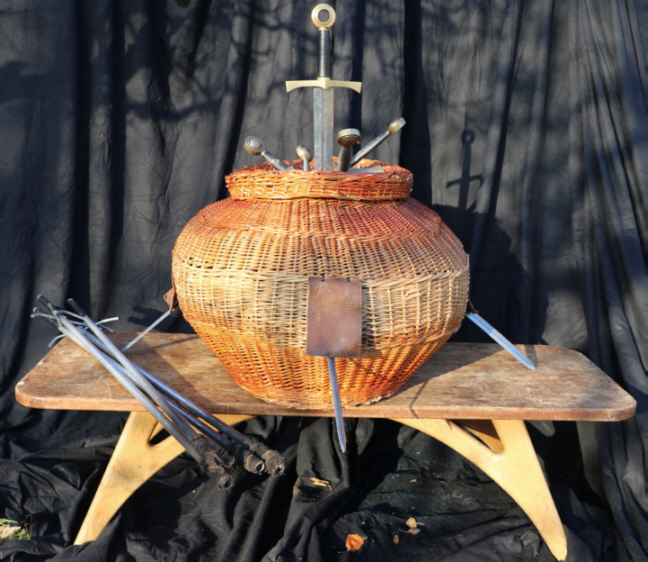 Hindu Basket illusion including fire swords and regular swords with table and ATA case. Shows wear but good working condition. Subtrunk shows wear but in good working condition. Includes ATA case. The illusion was used only once for a convention. The illusion can be performed surrounded. Consists of a base and a pyramid frame. The base has inside a solid steel frame and pyramid is made from plywood. The magican closes the four sides of the pyramid with four frames coverd with paper. The illusion is turned around and a person comes out by tearing one paper wall. This is just one of the effects you can do, but there are other possibilities to present this illusion. If you install a light inside you can make a shadow cabinet. Shadows of a person appears on thr paper walls . But when you open a wall nobody is inside. You close and when you open again a person appears. If you cover one side with a semipermeable mirror you can make that person appear gradually. You need a dimmable light inside and the mirror slowly becomes transparent and the audience can see the person inside. The base is so constructed that it looks impossible that there is a person hidden inside. 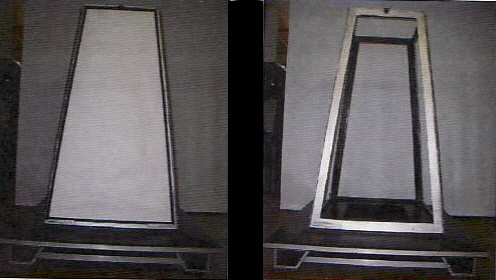 The base measures 60 x 60 inches. 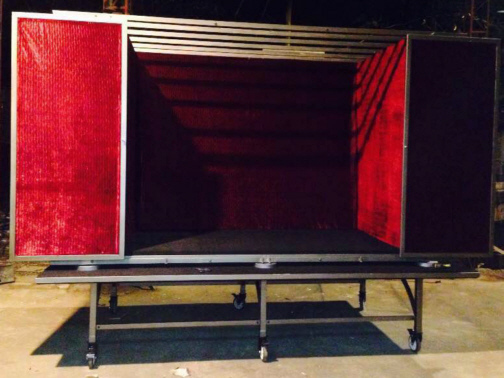 For transport a dolly is included so that you can wheel the base verically to enter stage doors easily. No ATA Case - It will be packed in plywood crate for shipping. -The illusion is a German product built by Gunter Puchinger. The condition of item is VG (Very Good) Used but is in good working order with normal wear. It has been used in shows by Sam Power and Kris Murphy - It's a great appearance. Allows making shadow pictures before the girl aparence. Includes a professional flight case. The condition of item is VG (Very Good) Used but is in good working order with normal wear. 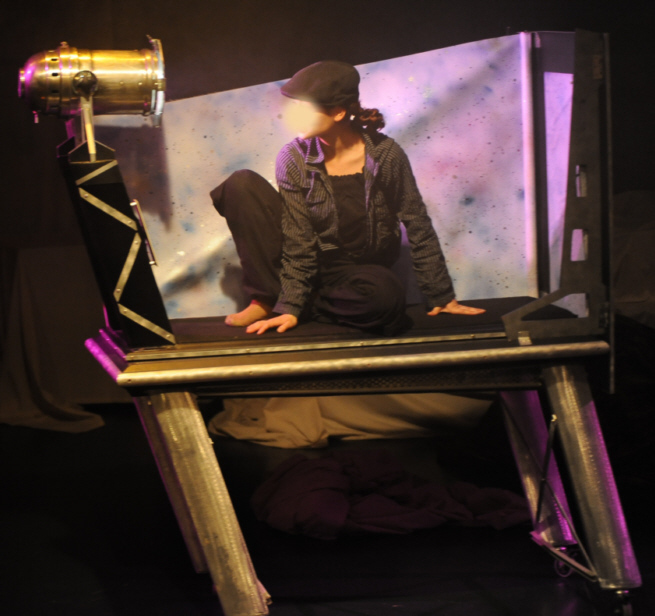 The girl floats up and down on the triangular aluminum platform. The Ultimate Levitation with the exception of the external control switch is self contained. 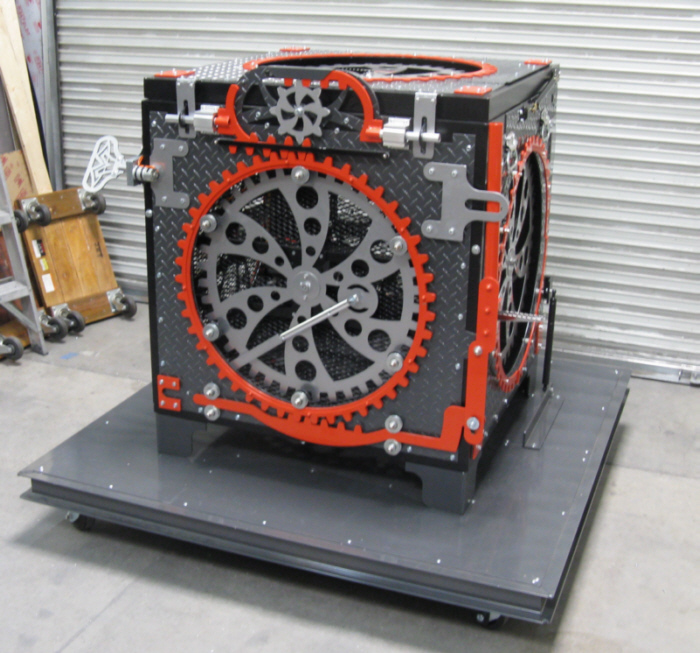 The entire rig is mounted on heavy-duty industrial casters. 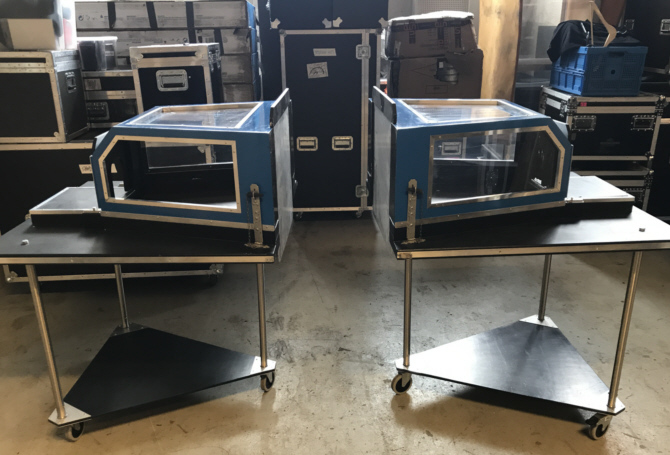 It includes a professional flight case. The condition of the item is VG (Very good) Used, but it is in good working order with normal wear. It's a great appearance for starting the show. The item has 3 steps. Includes a mechanism that produces a small flame that covers the flash appearance. Includes a professional flight case. Self contained illusion, everything operated by the magician, Assistant is seen floating and all around the magician.Self contained illusion, everything operated by the magician, Assistant is seen floating and all around the magician. 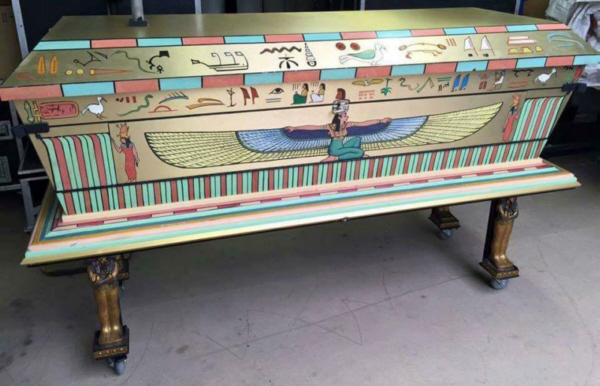 Sarcophagus Buried Alive Perfect condition in road case. Used during 1 entire season. Nothing to repair, works absolutly perfect. With the skull that bump, and wonderfull decorations. You have a real Traffic sign on stage.you will bend a spoon then you say we try something different , you check the sign also spectator can check and touch it. You concentrate on it and then on your command it start to bend. This is a remarkable experience that your audience will remember forever. It can be fully examined, there's nothing to find out. A true miracle. Why Matrix Sign? Matrix Sign looks like a real traffic sign and not a cheap toy No sleight of hand -No plastic - Please don't confuse this with similar metal bends: After the setup, Matrix Sign will bend on your command - Totally examinable - Biggest Metal Bending effect - Fast preset for next show - Real 5 cm diameter Metal - spectator can check and try bend after effect - You can bend slow or fast,stop or continue - Comes complete with everything you need plus instructional DVD. An unbelievable clear sawing in half. Only used one time for a special. Non-exclusive, non-transferrable performance rights fee of $4,000 USD is to be paid directly to Brett Daniels Productions, Inc. prior to sale of Brett Daniels Levitation. This fee is in addition to and separate from sale price. Magician stands on platform, holds a cloth and a girl magically appears floating in front of him. The girl rises up and down. The girl can float around the magicians body. The magician covers the girl with a cloth, she floats further up in the air, the cloth is pulled and she vanishes. Located in Norway - Crated for Shipping. It's been used only for two short-term contracts and therefore is in excellent shape. Three girls can be loaded! One girl enters the box, blades go through, box automatically unfolds to the zig-zag shape. and paint job + new battery. Includes shipping crate approx. 30 x 40 x 60inch - 170lbs. 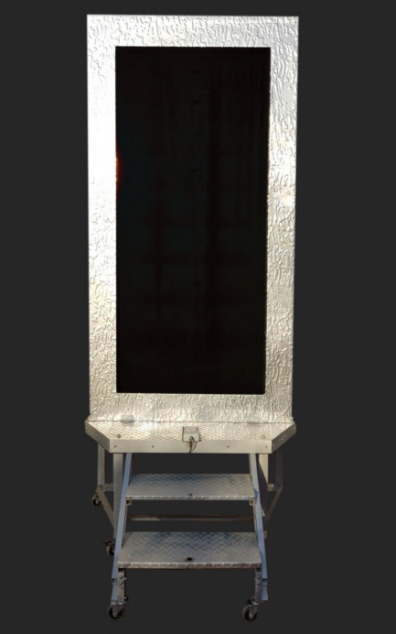 Will fit assistants up to 175cm (68inch) tall and 23cm (9inch) deep. Designed and Refurbished by Thomas Moore, built by Dream Concepts. Girl enters cabinet, 3 blades inserted...cutting her into 4 parts which are distributed across stage.She is re-assembled in "wrong order" But quickly and humorously, everything is corrected and she emerges from the cabinet unharmed! Works very well, some small holes in the rock but nothing serious. Includes wood crates. 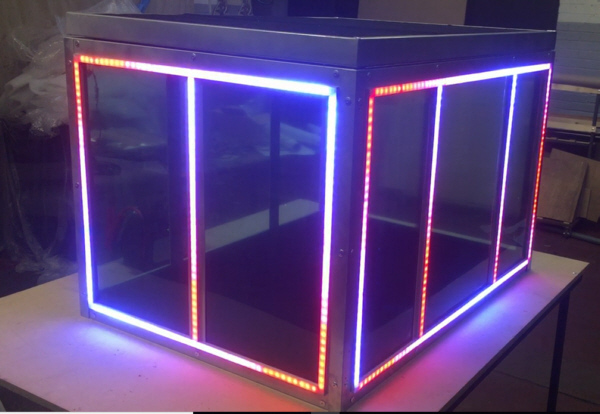 Clear sub trunk with programmable LED lighting décor. 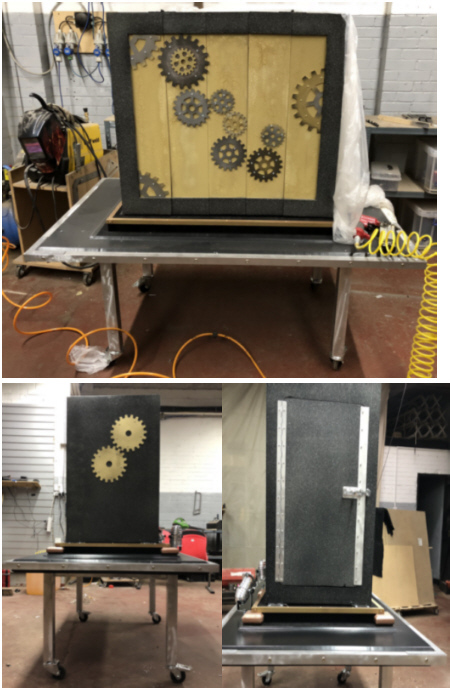 (can be completely reprogrammed to any colour/pattern you want, even with multiple changes during the routine) All aluminium construction, Perspex sides, top trap and is very light to transport. It was used in a resident show for one season. Doesnt pack flat so sale price will include a shipping crate for it. Prop has never been used for performance. Prop has only been used once for testing. Comes with Case. 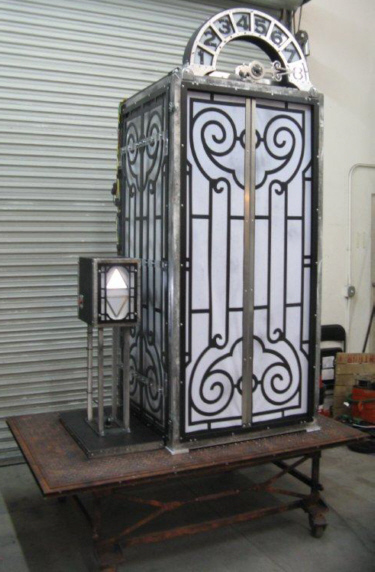 This prop has been used by many famous magicians as well on AGT performance by John Dorenbos NFL Magician. 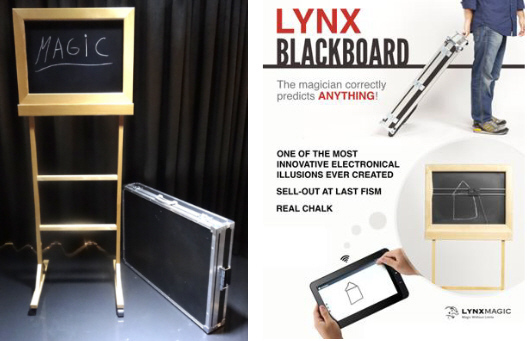 The Lynx Blackboard has an electronic system developed in the last 3 years which allows the magician's prediction to appear written in real chalk. Sold Out at FISM. Item is located in China. 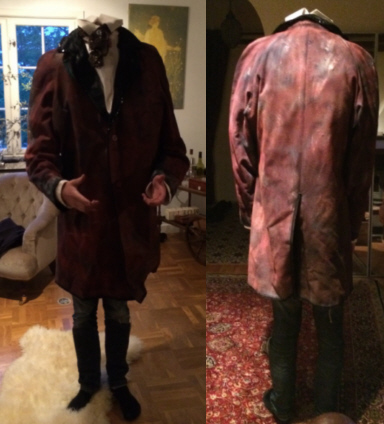 100% Authentic - Bought at FISM Convention. Dog, Cat, Bird, Rabbit, Duck etc. This special Firecage has been created with a wonderful dynamic design and is absolutely an eye catcher. Of course this jewel comes with a protective covering to keep the item safe when you place it backstage. It has only been used a few times - polished high quality steel. 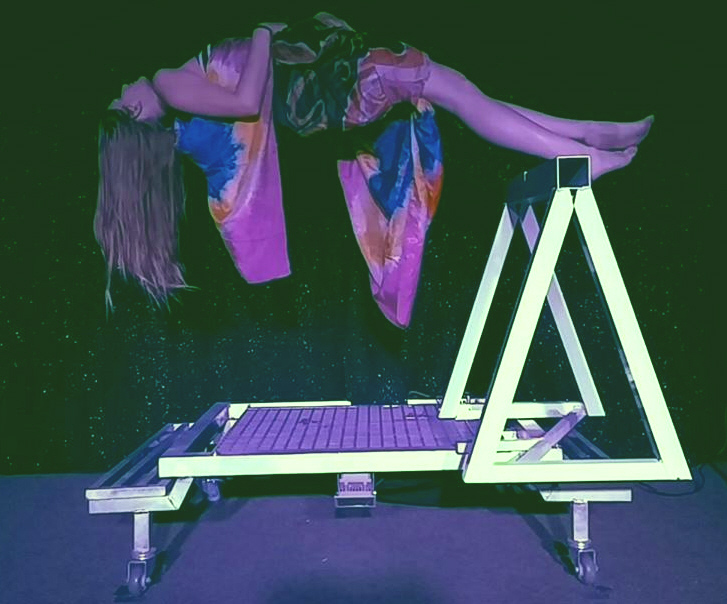 Just note that from the picture, the triangle frame (or sawhorse) can be completely removed and have the girl first suspended in air. It can then proceed on to a levitation. And the prop need not be placed near a curtain. I just had space limitation when the picture was taken so it was near the curtain. It was made by Dream Illusions (Jack Murray). Magician and his assistance get onto the platform. 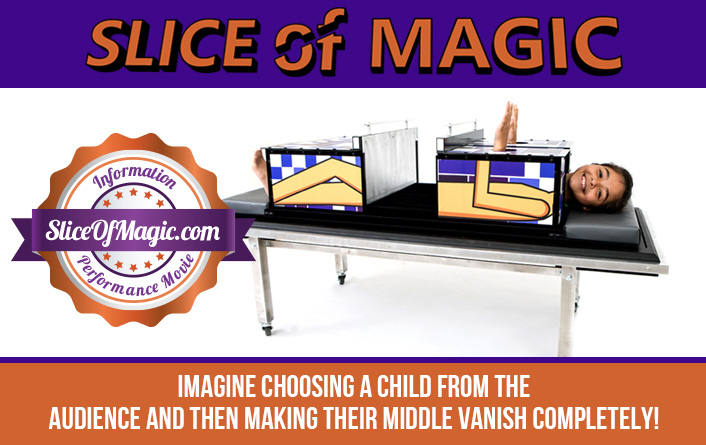 Magician lays his assistant on the saw bench and in the same position, is able to swing out the saw bench away from under her. She will be suspended in mid-air and can proceed on to levitate for 6 feet high. This unit is operated by a battery and "DOES NOT" require a direct AC plug to operate. Hence, it will be portable. Also the levitation is controlled by you at any point of time. It is NOT a timed sequence so you can let it go up and down as when you wish and like. This will ship in an ATA case. Very Good Condition - Used but is in good working order with normal wear. 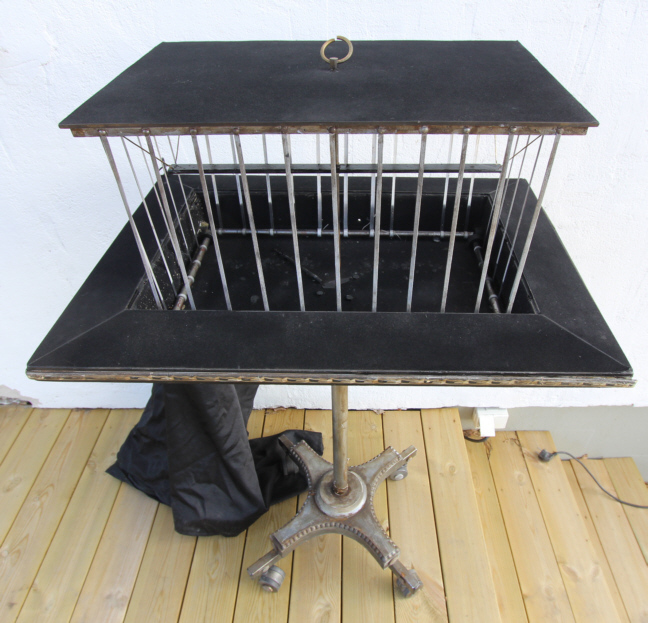 Vintage Norm Nielsen Vanishing Bird Cage. In good working condition but has had plenty of use. 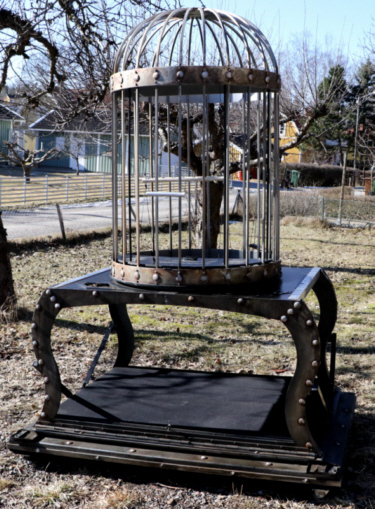 Magician covers the cage full of birds and tosses it up in the air and everything vanishes. Includes flight case. 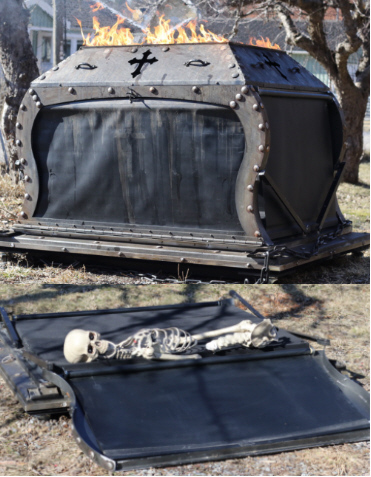 This is one of Norm Nielsens earlier versions that is decorated with a"steam punk" theme. The illusion rotates 360 degrees and then shown empty. Suddenly motorcycle or another large object appears. A drill goes through the assistance or the magician and lifts him/her into the air. This is Andre Cole's original illusion that I purchased direct from him. There are only two of this illusion in the world. Mustang illusion - This was custom built I am not sure but I think it was built by Dream illusions - Includes wood case. Car appears in the metal frame. "non-exclusive, non-transferrable performance rights paid direct to Brett Daniels Productions Inc. - these rights are hereby significantly discounted on a one-time only agreement with Brett Daniels Productions. Show was canceled prior to production - prop is brand new never used or used for rehearsals all aluminium CNC construction custom powder coated no expense or detail was spared in it's construction Magician pulls lever (orange) lower rack is pulled stage left This turns the main gear ring (orange) Main gear ring moves upper rack stage right, locking pin into stage right hasp on lid Small gear is turned by upper rack top teeth Small gear moves top rack stage left locking pin into stage left hasp on lid Magician inserts key into side of trunk and turns the key (like winding a music box) Gears start to spin while key slow turns Large piston on front gear also operates like a steam train wheel Trunk tips back to show bottom of trunk with a non moving gear. Custom spring damping hinges allow you to effortlessly tip trunk back and easily lower trunk back down. Person inside the trunk is visible thru the gears on all sides and top of trunk. Which ads to the impossible nature of the switch and speed Battery operated with individual variable speed motors. Allows you to control how fast or slow gears spin. Bottom of trunk is thick clear lexan. Lid has gas shocks to aid in opening and closing Side of trunk has gas shocks to aid in tipping the trunk back Retracting steps are mounted on sides of the trunk to aid getting in/out of the trunk easy. Unique, innovative, never before seen gaff design Music box style key winder powers the trunk for performance. Insert key and wind like a music box. Key then slowly spins as gears all spin during the effect Prop packs flat in 5 minutes wiring for motors are simple click together and pull to disconnect for transport/storage 2 custom diamond birch ata cases - at no extra charge made to fit standard doorway size In addition, they were made to take up the smallest footprint possible to save room backstage. 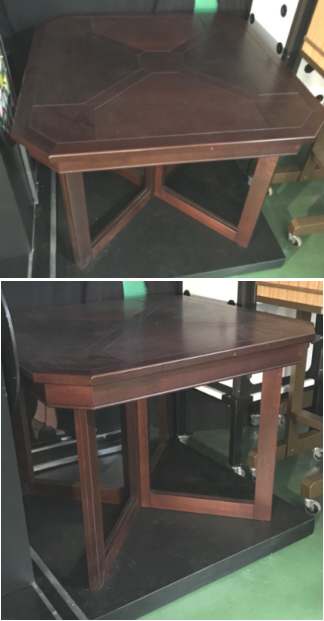 Great for cruise ships Separate case for props rolling dolly platform (trunk bolts to this platform) Many other features not listed. No cloth included. Spectacular illusion, beautifully built by Bill Smith. Rights have been paid - Ready to ship - Ready to Perform. Audience Dismember (Bill Smith Original) with Buzz Saw addition and Flight case. This has been resprayed, maintained and a modification added to allow the box to tilt into a higher position. The Buzz Saw blade does need replacing and although the battery pack does light the backdrop, it might need changing in the future. A great versatile illusion that can be a great corporate up-sell. Can be used for vanish or production.